I spent a blissful day up at Silverwood yesterday, watching Christy and Liam, as well as a few other friends and lots of area pros. It was a big “two shows in one” weekend, running three days, and some big names were in attendance. Ken Borden was there with Rashka, who’s been a USDF HOTY for the last three years running, at Training, First and Second, and it’s easy to see why this horse has more than 20 scores in excess of 80%. Yvonne Barteau and and her Grand Prix powerhouse GP Raymeister (who, incidentally, is Rashka’s sire) are always fun to watch, and they didn’t disappoint in the musical freestyle I caught. As much fun as it is to watch grand prix riders on fancy warmbloods, more than anything I still enjoy watching OTTBs go down the centerline. For me, Christy and Liam stole the show, garnering two more scores toward the bronze medal (yay!!!!) and really illustrating what teamwork is all about. It was a hot day, and the footing at Silverwood is deeper than at home. Christy rode her first test conservatively, to ensure she had gas in the tank for her debut at Second Level. They put in a good ride and got the score they needed before going back for round two. During that second warm up, Christy commented that she could feel that Liam was getting tired. It really didn’t show during the test, however – as usual, the two were in beautiful synch and harmony. After the ride, however, it became clear that Liam had given Christy his all. When I took him out to graze and cool off, he was reluctant to leave his stall, trudging slowly (that’s so unlike him) with his head drooping. Poor boy! He had been right there in the zone with Christy, and had left it all on the field. He perked up when we showered him with treats after he had a bath, though. He knew he had done well! I was overjoyed when we learned that Christy had indeed earned a score in excess of 60% at Second. She’s halfway to her bronze! It’s pretty exciting. 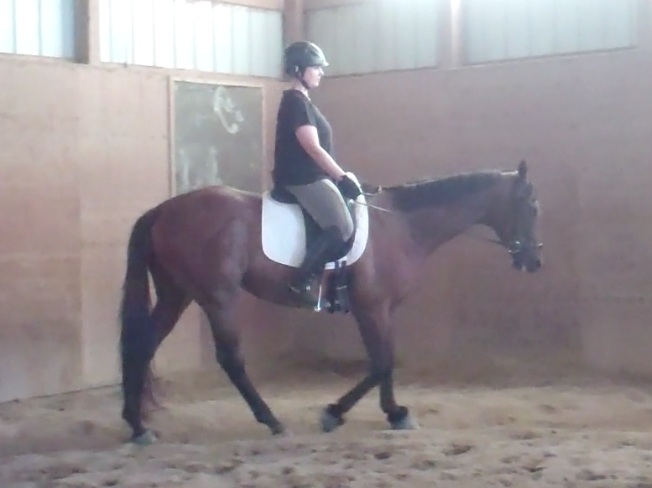 I also watched two other OTTBs. 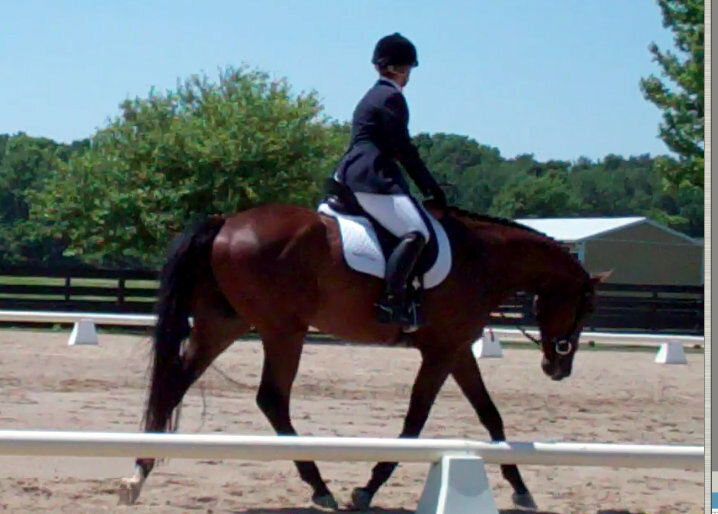 Linus, a 10 year old that evented Prelim last year, went out at PSG and I-1. He is a magnificent athlete and is a tempi-change machine. 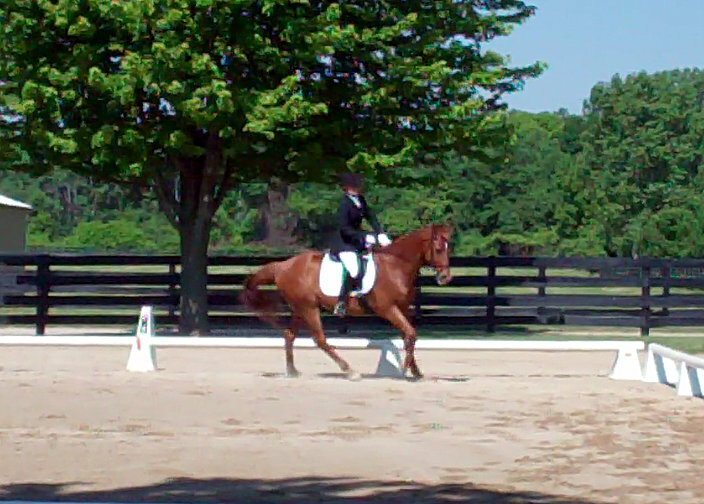 His owner, Carol, says he’s the most athletic horse she’s ever had, and that dressage comes naturally for him. Watching Linus, who carries a spectacular amount of muscle on his light Thoroughbred frame, is truly exciting and inspirational for anyone who loves Thoroughbreds. 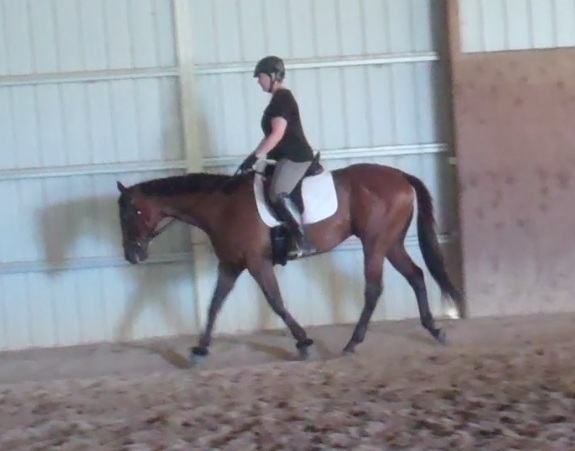 What he lacks in extravagant gaits he makes up in athleticism and enthusiasm. It’s going to be a fun summer watching him. Kelly and Bubba execute a very pretty stretchy trot. 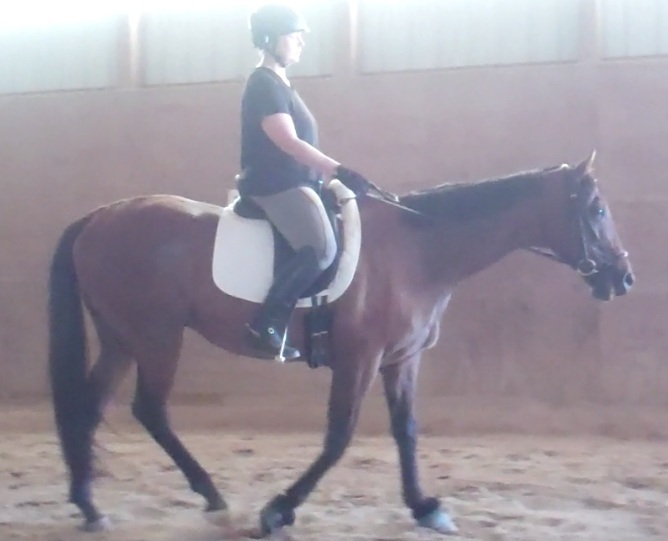 Our friend Kelly also had her green bean, a 5 year old OTTB she’s nicknamed Bubba, out for his first dressage show at Training. He’s done a couple baby combined tests, and is showing a lot of promise. However, he had some greenie moments during his test, taking exception to the judges booth and spooking whenever he came near C. Kelly rode with tact and empathy, staying quiet but insisting upon forward. As much as I loved watching Liam and Linus, Bubba’s test was inspiring for me. Kelly did a wonderful job of keeping the horse on the aids, and had some very nice moments, including the pretty stretchy trot pictured to the left. The Thoroughbreds all acquitted themselves very well, and garnered compliments from onlookers, who admired how light and refined they appeared in the ring – the differences really are evident because most of the horses doing rated dressage shows are heavier warmbloods and draft crosses. This morning I uploaded all the video I took yesterday, and watched all the rides once again. Then I put on my britches and headed out to the barn, where I rousted Derby from a late-morning nap in the sun. With visions of Bubba’s stretchy trot in my head and Christy’s words from last week’s lessons ringing in my ears (“He needs to be rounder. Rounder still. Half halt. Again. Again. Soften the inside rein. Inside leg on. Half halt. Again!!! MAKE IT HAPPEN!”) I paid attention to differentiating between bracing contact and good, roundness. I half halted, and half halted, and half halted, but I was able to get Derby’s back up, and best of all, I was able to hold it. Getting and maintaining roundness will be the absolute key for us in the coming weeks. Everything is so much easier when you’re operating from that essential “ready” position, with a forward, round, connected horse.